Using WordPress exclusively in the traditional sense of content publishing would be a total waste of your time and resources. So why not focus instead on rewarding your customers with sophisticated yet practical web applications built on WordPress? While we are committed to excellence and always strive to develop fully customized applications from scratch, we master the alternative just the same. 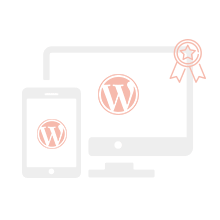 WordPress theme development – we create bespoke, responsive themes from scratch, with the best coding practices in mind. Furthermore, we handle the installation and customization of these themes, as well as API integration and e-commerce integration with WooCommerce. 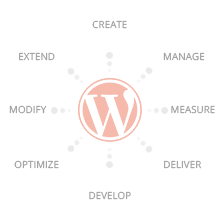 WordPress plugin development – we develop custom, 100% scalable, user-friendly and dynamic plugins for any theme, always testing compatibility and quality with the latest WordPress version. Our customized plugins are easy to use, flexible enough to allow future enhancements, and perfectly tailored to meet the specific requirements of your website. WordPress maintenance and support – we handle your WordPress account with expert solutions and practical recommendations for the most suitable theme upgrades, plug-in installation and updates or custom modules implementation without any risk of downtime. We can also provide simple and practical guides written in plain language on how to use modules and we take care of any malware removal or hack cleanup necessities. 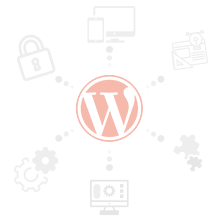 WordPress performance and security– we provide you with expert security solutions to prevent hacking, we backup and protect your data automatically and we optimize the speed and performance of your WordPress platform. Moreover, we can handle w3 total cache professional configurations, server support included, CDN implementation and SEO optimization. WordPress hosting – whenever you decide that you’ve had enough with WordPress or that you do not want to worry about it anymore, we can help with effective project management and consultancy for best coding practice and presales. WordPress outsourcing services – whenever you decide that you’ve had enough with WordPress or that you do not want to worry about it anymore, we can help with effective project management and consultancy for best coding practice and presales. There is no better start other than projecting an accurate image of your business. We always begin by assigning a Project Manager exclusively for you, who will maintain active communication and thoroughly evaluate your project needs. We analyze your business profile and determine the most effective cause of action. After that, we start working methodical but fast, always with your requirements in mind. We listen to your vision and ideas, we go through all your specific marketing goals, and should WordPress be the best solution for your particular situation, we go ahead with the coding. Through a deep understanding of programming principles, we plan and implement the best strategies. Our flawless coding is just the final step towards your digital success. Talk to us about what’s next for your WordPress project.